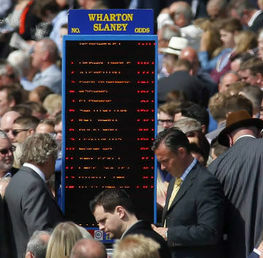 How to bet at the Cheltenham Festival. Some people work hard all year to create the perfect family Christmas. Some of us look forward to well-deserved long summer breaks in sun soaked tropical resorts. Some of us get excited towards the end of June as the Glastonbury Festival showcases some of the best musical talent in the world. We all have highlights in the year in which we work and save for. But for some, the whole year is defined by four frantic days in March when like-minded enthusiasts descend on the home of National Hunt racing to enjoy the spectacle of the best winter equine gladiators staking their claim to the top prizes in the sport. It’s also the closest parallel to a betting utopia. FIRST RACE, FIRST BLOOD! IT’S A GIVEAWAY!! Above: Altior wins the 2016 Supreme Novices Hurdle beating the Willie Mullins trained Min.He looks set to provide banker dividends in this year’s Arkle Chase on Day 1. For the last several years, the first race of the meeting, The Supreme Novices Hurdle (now sponsored by SkyBet) has been the subject of some almost unbelievably generous offers from many of the top firms. It’s important for the bookmakers to gain your interest right at the start of the meeting and you should take full advantage of this. Melon, trained by Willie Mullins, is the current ante-post favourite at 7/2 (SkyBet, Stan James, Betfred) and he looks to be a good thing based on his latest outing at Leopardstown at the tail end of January. Mullins has a lethal record in this race in recent Festivals. A hefty punt on Melon through one of the enticing offers may just be the perfect start for the Festival or at worst, a little cash reserve for later bets if this favourite is overturned. Best laid plans can often come undone, so heavily backing one horse that is guaranteed to come in at short odds is essential in order to stem the tide. Last year was a great success as we pinpointed the now legendary Thistlecrack in The World Hurdle to carry the burden, which thankfully paid off. 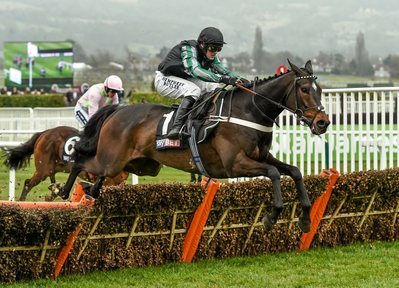 This year, although at far shorter odds, the best viable option looks to be last year’s Supreme Novice hurdle champion, Altior (1/3 with most) in The Arkle Chase on Day One. He has been utterly invincible all season and there is nothing that will trouble him in this renewal of the novices 2 mile chase championship. His nearest rival, the versatile Yorkhill (9/1 with Betfair Sportsbook) has a number of entries at The Festival and is unlikely to take on Altior. 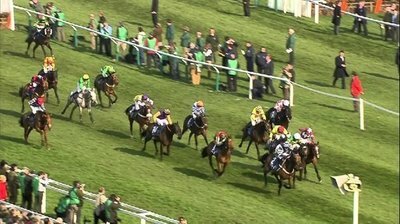 Above: A typical blanket finish in The Coral Cup, one of the most competitive and exciting handicaps of the Cheltenham festival. Handicaps during The Festival provide some of the most memorable entertainment over the four days with nearly every race providing a blanket finish and plenty of outsiders getting into the winners enclosure. However, they must be treated with the upmost caution: you will not find your banker here. Plenty of sources will be lining up to give you the big handicap snip of the week with enticing odds and attractive sound bites from the connections. Considering that every handicap is 20 runners +, it’s wise to keep your head and do your homework. Therefore, make a checklist. Does the horse have a tendency to laze at the end of races? If it does, leave it. The Cheltenham Hill doesn’t take prisoners. The horse must have staying credentials. Is it a sound jumper for chases? The Cheltenham fences are the toughest in the business, especially the penultimate straight when approaching the third last, which has a tricky downhill approach: it dashed the hopes of Cue Card last year in The Gold Cup as well as Silviniaco Conti in 2013 when both were running into contention. The sort of horse you should look for in a handicap is one that is on the upgrade, on a winnable mark (carrying no more than 10.7 or 10.8), not too old (6-8 yr. olds best) and has a tendency to perform well in Spring: it’s so common to see horses performing below par throughout the autumn (probably due to the easing ground) and then suddenly burst into form at the Festival with livelier ground. Finally of course, take full advantage of the generous each way offers: plenty of firms will be offering up to 5 places or even 6 places for each way bets in all of the handicaps. ANTE POST BETTING: START NOW! Throughout the season, ante post (i.e. bets placed at least a day in advance) bets can be a rewarding financial proposition but carrying huge risks as witnessed by the withdrawals or untimely deaths of some of the big guns: Annie Power, Faugheen, Don Cossack, Vautour, Thistlecrack and Arctic Fire have all hit punters hard. However, at the time of writing, three bookmakers (SkyBet, bet365 and Paddypower) are now offering “non-runner no bet” options which means if you take the odds now, you will not lose your stake if your horse is withdrawn. More bookmakers will follow suit in the next week. 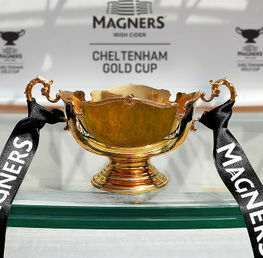 This is definitely a good option for picking out big priced handicap chances but it is probably not wise to go for the high profile Grade 1 favourites (Any horse in the Gold Cup or Douvan in the Champion Chase for example) as bookmakers will be looking to “get” these horses with bigger prices on the day of the race. THE CHAMPION CHASE: 1ST OR 2ND in the betting is nailed! Unlike the Gold Cup or Champion Hurdle where an assortment of winners have fluxed punters over the years, The Queen Mother Champion Chase has been an ever reliable source of providing 1st or 2nd favourite winners down the years. This year looks like no exception as Douvan and Un De Sceaux will lock horns in what will be the biggest all Mullins clash of the Festival. Sizeable single and forecast punts are recommended for this Grade 1 event. STEAR CLEAR OF THE NOVELTY RACES! Above: The Cross Country Chase. Great to watch but best avoided as a betting proposition! The Festival includes a number of races which are designed to attract the floating enthusiast. 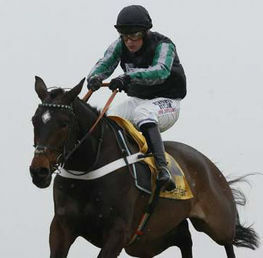 These are the Cross Country Chase (Wednesday) and The Foxhunters Chase (Thursday). 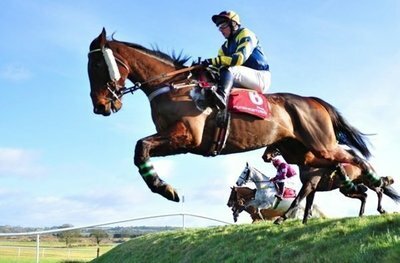 The Cross Country can be particularly dangerous to punters as it often attracts classy 11/12 year olds looking to wind down their careers and offering enticing odds. In most cases, the gruelling nature of the course with its consistent undulations and madcap fences (including fences in alarmingly quick succession and mini hills) is too much for the uninitiated. If you are going to play with this race, stick to horses which have done the course and stayed. The Foxhunters should be treated the same way as most of the jockeys have limited experience of the Cheltenham track and considering the time of the race, immediately after The Gold Cup, it’s probably a good time to put the kettle on and relax! Don’t go mad. So many talking horses have met their nemesis at the Festival. Choose your bankers carefully and keep the handicap punting to a fun level. Be sure to size up the form in the novice hurdle events and be extremely wary of the Irish challenge as Irish owners and trainers are legendary for being economical and shrewd with their information! Many of the Irish horses have been primed only for Cheltenham and it’s imperative to get a good insight into their form at lesser known tracks such as Down Royal, Dundalk and Thurles where they have been quietly prepped for the big ones at Cheltenham. Have a wonderful four days, punt carefully and cautiously and remember when the funs stops...stop. 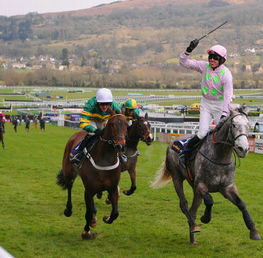 Visit our dedicated Cheltenham Festival page here to keep up to date with the action!